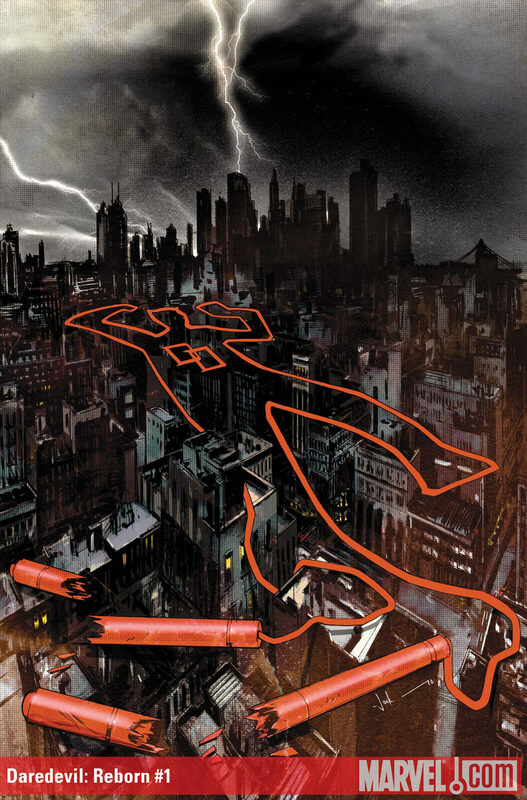 Daredevil #511 came out yesterday and will get its own review later today. Again, I want to apologize for not being as active as I could be as far as this blog is concerned. Sadly, it’s not for lack of time, but for lack of inspiration. Since I’m not really happy about where Shadowland is going, it’s hard to muster the enthusiasm to write about Matt Murdock, a character who’s been virtually absent for a few months now. Having said that, I’m still intrigued about Daredevil: Reborn which, in order to score a win with me only needs to, in whatever small way, actually be about Matt Murdock. You know, the character who is at the core of everything Daredevil – the book and the persona – should be about. Below is the cover to Daredevil: Reborn #1 and the text from the solicit. Watch out for spoilers. Last, but not least, if you have any suggestions for things you’d like me to post about, please let me know! I’m feeling exactly like you Christine , I’m reading without enthousiasm the books , in tne meantime I’m re reading the Bendis run to find my DD, can’t wait it ends.. I hope it’s good, but given what he’s done with Shadowland I don’t have much hope. I defintely won’t be picking this up on an issue to issue to basis. After Shadowland, I have no reason to trust Diggle so I won’t be shelling out the money for what is definitely a risky venture. If it’s good I’ll buy the trade. I hope it’s good but I’m not holding my breath. After Shadowland, I have no reason to trust Diggle so I won’t be picking this up on an issue to issue basis. If it’s good I might pick up the trade. The Shadowland mini smacks of editorial meddling. The writing is nothing like what we’ve come to expect from Diggle. Characters were included for no apparent reason, save the fact that they’re popular characters. The Beast possession is a cheap cop-out. Everything about the story goes against what he was building toward and is a complete u-turn from what the Daredevil title has been about for the past 10 years. Marvel probably looked at the sales figures of Captain America: Reborn and Incredible Hercules and thought “we can do the same thing with Daredevil and the sales figures will skyrocket”. I still have faith in Diggle and Johnston. No one can do a good job if their boss is hovering over their shoulder and second guessing everything they do. This event is a pathetic attempt to get more people to read a Daredevil story, regardless of how terrible it is. If they would have just let Diggle and Johnston tell their story without making mandates and drastic changes, none of us would be furious about our beloved character being desecrated. I will say this about Reborn…if it’s not Matt Murdock, I will never buy another issue of Daredevil. No exceptions. I’ve already vowed to not buy Black Panther, even though he’s one of my favorite characters. On principle, I refuse to fall for Marvel’s shady tactics. I’m 99% sure the mystery man has to be Matt Murdock. There’s the whole redemption bit, as well as “a man with nothing to lose,” and this also matches some of the things that Diggle was hinting at many months ago when he let one slip on Twitter (not that it was anything huge, he’s said almost as much in interviews). @Aaron: I had the same reaction as you; I also thought it was supposed to be a six-issue mini. Did that change or did we both get the wrong impression? Okay! Back to writing my Daredevil #511 review which should be up shortly. I’m guessing it’ll be Matt, because if it’s not no one will care. I’m sure they stopped short of saying “don’t miss the return/redemption of Matt Murdock” so people will buy it to find out for sure. Plus, what’s the point of having an event, with the purpose being to attract more readers, just to kill off the character for good? Sorry about the double post above. When I posted my first comment it did not show up so I figured there was a glitch and posted again. DOH! I have sympathy for Diggle, but I’m not willing to give him a free pass. But I don’t want to burn him at the stake like some DD fans either. I’m not saying editorial hasn’t had a heavy hand in all of this, but it’s easy to blame everything on editorial. Diggle has said that the story they are telling is what he pitched Marvel to get the gig. I’m sure editorial added a lot, but the core of it all is his. The title does bear his name and not “Marvel Editorial.” Some of the responsibility does lay with Diggle. If he felt strongly about his story and/or the character and knew that the story was not quality after the supposed editorial changes he could have walked. There have been writers that have walked away from titles for far less. But it’s not the best of times to walk away from work and a stunt like that may sour his relationship with Marvel so I understand why he would not do that. But that doesn’t change the fact that his reputation has suffered and that he’s let us down. I think it’s fair to question whether he is fit to write DD after this Shadowland business. I mean, Shadowland isn’t just mediocre, it’s downright awful! He now has something to prove. It’s all on him. Hopefully he’ll lick his wounds and come back with a better story or leave it to someone else. Notice I haven’t lumped Johnston in all of this because, as Johnston has said before, it’s Diggle’s book and Diggle is the driving force. I’d say Johnston is one of the reasons the regular DD title is still pretty decent! Everything Johnston has been involved with involving Shadowland has been good or very good and I think that’s no coincidence. I like Johnston’s writing and I’m definitely looking to read more of his work. Despite Marvel’s protestations about pricing for new titles, for me to continue plunking down 4 bucks for this, it bloody well better have Matthew Murdock in it. After all this possession rubbish, to have someone else come in and take over the role of DD would feel like a final slap to the face. Side note: I have a buddy who says DD’s billyclub is a glorified broom stick. I tell him its not. This cover does not help my case.